A historian and an anthropologist come together to speak on Kashmir—a picturesque Himalayan region with a longstanding self-determination movement (Tehreek)—which has been subjected to several interstate wars between India and Pakistan, and persistent violence. 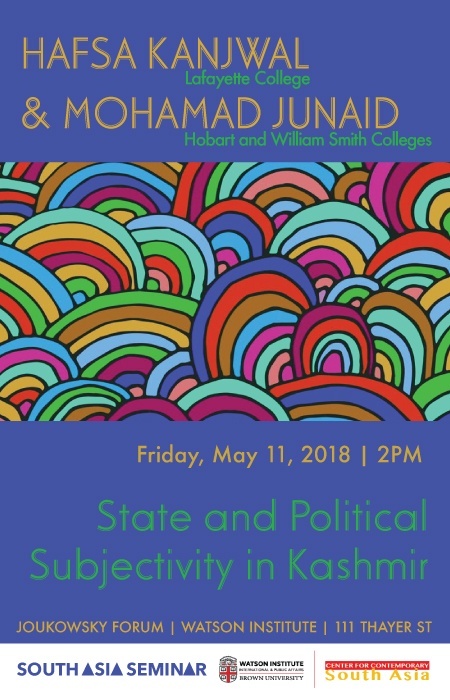 Hafsa’s talk will focus on how Kashmir's disputed political status engendered a particular form of developmentalism in the 1950s and 1960s, and the implications this had for the period of State-formation in the aftermath of the region’s contested accession around the time of partition of the Indian subcontinent. Junaid’s research covers the themes of military occupation, space, memory, and political subjectivity in Kashmir since the late 1980’s when Tehreek became a mass movement and an armed struggle. Together, the two presentations will cover post-1947 developments in Kashmir, to not only highlight the development of State institutions and their workings in a legally disputed and militarized context, but also the mechanisms by which people negotiate the precarity of such political forms and also propose alternative political visions. Hafsa Kanjwal is Assistant Professor of History at Lafayette College. She completed her PhD in history and women’s studies at the University of Michigan at Ann Arbor, focusing on contemporary Kashmiri history. Her interests include: South Asia, Kashmir, Islam, Women’s and Gender Studies, Islam in America. Kanjwal has written on Kashmir for a variety of news outlets including The Washington Post, Al Jazeera America, Kindle Magazine, Foreign Policy Magazine, Kashmir Life, Kashmir Ink, and the Al Jazeera Center for Study. She has spoken on Kashmir for Al Jazeera English's The Stream and Inside Story news programs. Mohamad Junaid is Visiting Assistant Professor at Hobart and William Smith Colleges. He completed his PhD in Cultural Anthropology at the Graduate Center, City University of New York. His writings focus on military occupation, space, memory, martyrdom, and violence in Kashmir. Junaid has contributed to edited volumes; Everyday Occupations: Experiencing Militarism in South Asia and the Middle East (2013); Until My Freedom Has Come: The New Intifada in Kashmir (2012); Of Occupation and Resistance (2013); The Hanging of Afzal Guru (2013); and They Gave Us Blood: Normalcy, Sacrifice, and Terror in Kashmir (forthcoming). His essays have also appeared in Economic and Political Weekly, Greater Kashmir, Kashmir Reader, Aljazeera, Tehelka, and Guernica.